I am a 63 year old retired individual. Most of my life, I was like most people, stuck on the hamster wheel trying to make a living. Like most people I “blindly trusted and beLIEved” what I was taught or told. I became an environmental activist about 10 years ago, when I could see the degradation of our environment and felt the need to get involved. One day I watched a documentary that changed my life and my perspective on reality as we know it. It made me realize that I could no longer trust what people in authority were telling me. I began to question everything. It sent me down a path to covering many topics. One of these topics was the subject of health and fluoride was part of it. I could see that there were many things happening in the world that most are unaware of and I felt that I needed to bring awareness to the general public and be part of the awakening that is happening. Headlines like these made me very concerned for my (grand)children’s future. Studies show that brain disorders are the result of excessive environmental toxin exposure from different sources. My concern for the health and safety of our children has motivated me to become a full time activist. I have made 4 documentaries and put together 3 sites/ blogs and this is my fourth. I did want to do something about ending water fluoridation some time ago, but just couldn’t figure out until recently how to make it unique. Now I have and so we begin. When we turn on our taps we expect the water to be as pure as possible and free of any contaminants that could harm us and our children. What if I told you that is an assumption that we have all made at one time or another and “we trust” that the people who provide our drinking water would never put anything in it that could harm us in any way. Well those are in fact false assumptions due to unearned trust. And I will show you that trust has been broken as you will be shocked by the revelations found here. We will not be debating the science showing fluoride is safe and effective as the courts have reviewed all the scientific evidence and judged fluoride is not safe and is not good for our teeth. Most of the information I present here comes from the USA, as that is where water fluoridation had it’s beginnings. The idea and the science that supposedly backed it up, was then exported to other countries. In fact the fluoridation product that is used here is also imported from Florida. As well the science that is used to regulate fluoridation here, comes from there. Under the Ontario’s Safe Drinking Water Act water fluoridation is regulated under NSF Standard 60 , which is an independent American based, not- for-profit, non-governmental organization . Fluoride is any combination of elements containing the fluoride ion. In its elemental form, fluorine is a pale yellow, highly toxic and corrosive gas. In nature, fluorine is found combined with minerals as fluorides. It is the most chemically active nonmetallic element of all the elements and also has the most reactive electro-negative ion. Because of this extreme reactivity, fluorine is never found in nature as an uncombined element. Fluorine is a member of group VIIa of the periodic table. It readily displaces other halogens—such as chlorine, bromine and iodine—from their mineral salts. With hydrogen it forms hydrogen fluoride gas which, in a water solution, becomes hydrofluoric acid. There was no US commercial production of fluorine before World War II. A requirement for fluorine in the processing of uranium ores, needed for the atomic bomb, prompted its manufacture. Yes. Fluoride is an acute toxin with a rating higher than that of lead. According to “Clinical Toxicology of Commercial products,” 5th Edition, 1984, lead is given a toxicity rating of 3 to 4, and fluoride is rated at 4 (3 = moderately toxic, 4 = very toxic). On December 7, 1992, the new EPA Maximum Contaminant Level (MCL) for lead was set at 0.015 ppm, with a goal of 0.0ppm. The MCL for fluoride is currently set for 4.0 ppm – that’s over 250 times the permissible level of lead. Fluoride used in water fluoridation is also a toxic waste product — which means it contains other heavy metals. It is the most bone seeking element known to mankind. The US Public Health Service has stated that fluoride makes the bones more brittle and dental enamel more porous. How Much Fluoride am I Taking In? Current total intake is now estimated to be between 5 and 7 mg/day in “optimally fluoridated” areas. Current fluoride intake is equally divided between drinking water (in fluoridated areas), food, other beverages, and dental products, meaning that even if you don’t live in a fluoridated area, fluoride is endangering your health. Average fluoride content in juices is 0.02 to 2.80 parts per million, in part because of variations in fluoride concentrations of water used in production. Children’s ingestion of fluoride from juices and juice-flavored beverages can be substantial and a crucial factor in developing fluorosis. Here is a newspaper clipping from 1918 of a news story that claims Sodium fluoride as an insecticide kills insects upon contact. The specific fluoride chemical used to fluoridate your drinking water is: hydrofluorosilicic acid ( HSFA ). Hydrofluosilicic acid is the most corrosive chemical agent known to man. It is an unpurified industrial (toxic waste) by-product that comes from the wet scrubbers of the smoke stacks of the phosphate fertilizer & aluminum industry? Due to the lack of processing, this chemical is known to contain a number of toxic substances in its fluid mix such as FLUORIDE (20 to 30%), LEAD, ARSENIC, MERCURY, and it usually contains any or all of the following substances as well: cadmium, selenium, radium, radon, polonium, radioactive uranium 238, chromium and phosphorus. The Fluoride Deception is the latest mini documentary from Mike Adams, executive director of the Consumer Wellness Center. Through the use of animation and motion graphics, it exposes the truth about where fluoride really comes from: The toxic byproducts of the phosphate mining industry. Now I would like to cover an important document. It is called a Material Safety Data Sheet. What does the material safety data sheet say? Is the water fluoridation product safe to use? 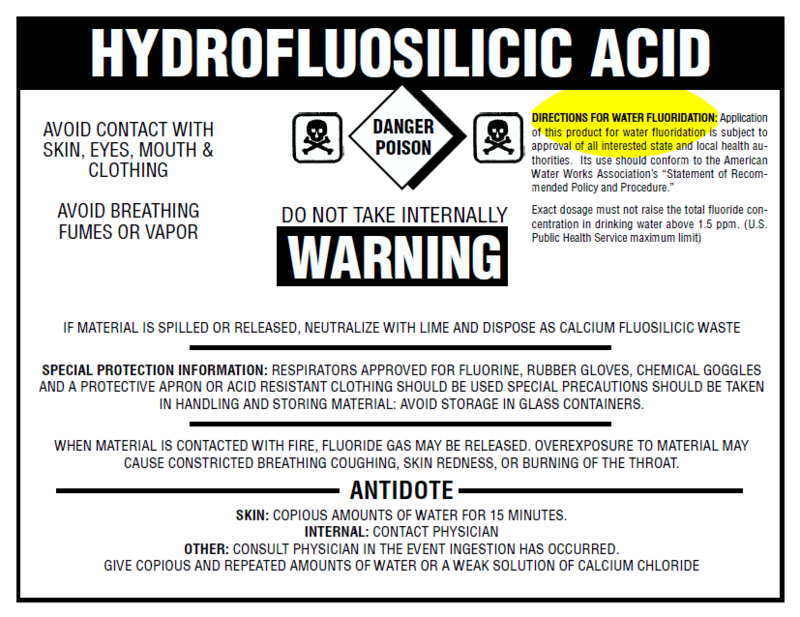 The manufacturer’s MSDS of the Hydrofluosilicic acid used here clearly warns that hydrofluosilicic acid, what is being called “Fluoride”, causes harm contrary to what everyone is being told. So, what we have here is called disclosure, just like pharmaceutical TV commercial, as to what health effects can be expected if this ingested. Why do manufacturer’s do this? To avoid liability when these health issues occur and they do. Basically, they say, “we told you so”. So who gets to see this? Definitely not the consuming public. This information has in fact been suppressed by key people in governments at all levels, especially by those working in the health departments. They are the ones who are pushing this on an unsuspecting public, who have unfortunately been duped by them, as so many others. I will cover this as we go along. ……. Acute fluoride exposure at high concentrations will cause corrosive damage to tissues. In contrast, chronic exposure, which is seen more frequently, causes delayed or impaired mineralization of bones and teeth. The solubility of fluoride correlates generally with the degree of toxicity. Fluoride is known to interact with various elements, including aluminum, calcium, phosphorus, and iodine. Fluoride is a cellular poison that interferes with the metabolism of essential metals such as magnesium, manganese, iron, copper, and zinc. Because bacterial metabolism may be affected in a similar manner, this attribute accounts for the use of fluoride in dental hygiene products. Soluble fluoride is rapidly absorbed; ~50% is excreted by glomerular filtration. More than 95% of the fluoride that is retained is deposited in the bones and teeth, forming hydroxyapatite after the interference with calcium metabolism and replacement of hydroxyl ions. At low levels of fluoride exposure, the solubility of the enamel is reduced, resulting in protection. At higher levels of exposure, the enamel becomes dense and brittle. If exposure occurs during pregnancy, developing bones and teeth are severely affected. Faulty, irregular mineralization of the matrix associated with altered ameloblastic, odontoblastic, or osteoblastic activity ultimately results in poor enamel formation, exostosis, sclerosis, and osteoporosis. From the Fluoride Free Windsor website. The Safe Drinking Water Act (of Ontario) states that all water systems must meet licensing requirements. The license requires that chemicals used meet the National Sanitation Foundation Standard 60. This standard provides criteria to conduct a toxicological risk assessment (it must be tested for SAFETY!). “The NSF standard requires that the chemicals added to drinking water, as well as any impurities in the chemicals, be supported by toxicological evaluation.” Stan Hazan, General Manager, Drinking Water Additives Certification Program, NSF “A toxicology evaluation of test results is required to determine if any contaminant concentrations have the potential to cause adverse human health effects” NSF Fact Sheet 2008 The US Environmental Protection Agency, the National Sanitation Foundation and Dr. Heimann himself admit these toxicological studies have never been done. Hydrofluorosilicic acid does not meet the legal requirement that it conform with standard nsf60. No studies on the product means no proof of safety and no compliance with regulation. There is no legal fluoridation product – the practice needs to end. On February 29, 2012 Windsor Utilities Commission passed a motion to recommend that the City of Windsor cease artificial water fluoridation. The US Centers for Disease Control (CDC) and Prevention named community water fluoridation one of 10 great public health achievements of the 20th century. We are also told that fluoride is Safe and Effective. However what we are most often being told about water fluoridation is not based on facts and I will show that here. I will also show that it is being done illegally. In fact I will show you that the water fluoridation process is a fraud and that most us have been deceived. Many people who promoted the process, came to realize later that they had been duped after doing more research. I will provide some of their stories as well as court cases, that have declared that the water fluoridation process causes harm, has no real science to back it up and more. I will do my best to unravel this lie in a logical process so that most can grasp it. In a future post I will show you how science can and is being bought by big corporations to increase profits at the cost of our health and the environment. This is a short interview with David C. Kennedy, DDS, and former head of the International Academy of Oral Medicine and Toxicology. In 1955, when I wrote the article which is now Chapter 4 of “The American Fluoridation Experiment”, (1)1 knew in a general way that Industrial pollution of air and water with fluoride provided a strong motive for promoting fluoridation of water supplies. But I knew few of the details, and had no idea how strong the motive was. I knew far more when I testified to the Councils of the American Medical Association, in August 1957; (2) but the picture was far from complete. It is now clear that the one utterly relentless force behind fluoridation is American “big industry”, and that the motive is not profit, as such, but fear. Read more. I have to disagree with the late doctor, as it is the fear of the loss of profits that drives big industry as he calls it. Below is a copy of the Freedom Of Information Act (FOIA) document that reveals the City Of Chicago spent $36 million to add fluoride to the drinking water. The FDA lists Fluoride as a poison. The City Of Chicago and countless other cities add fluoride to the drinking water which used to be the main ingredient in rat poison and is used in psychotropic drugs such as Prozac, Luvox and Paxil. Water fluoridation is the ideal solution for industry’s fluoride waste disposal problem. Like the tall smoke stack introduced a decade earlier, it diverts and disperses pollutants far and wide. Chemicals that would cost $7,000 per tanker to dispose of are sold instead to cities at $265 to at least $722 per ton. Consequently, the phosphate fertilizer manufacturers invest millions of dollars in grants and lobbying of government officials to promote water fluoridation. Contaminated with arsenic, lead, barium, cadmium, and mercury, no analyses of fluorosilicic acid are performed at the source, and only rudimentary analyses are performed at water treatment plants prior to their injection into public water systems. In many artificially fluoridated areas, the lead and copper content of the water exceeds EPA/Safe Drinking Water Act standards. This occurs because of the caustic nature of fluorosilicic acid and its capacity to leach copper and lead from soldered pipe joints and brass fixtures. Main stream science, the medical as well as the dental community will tell you that a few tin foil wearing hat people are behind the conspiracy theory that fluoride is poison and that it causes harm. Well I put this site together to let the unheard of facts speak for themselves and let you decide. When people actually stop beLIEving what they are told and do their own research they usually come to a different conclusion. Below are two professionals, who tell their stories on how they were duped by the pro-fluorodationist deception, using innacurate data to push their fluoride agenda. I am Dr. Richard Foulkes. I am an M.D., a health care administrator and former assistant professor in the Department of Health Care and Epidemiology at the University of British Columbia, Canada. I was, also, in the 1970’s, a special consultant to the Minister of Health of British Columbia and commissioned by the Government to study the health care system of that province. …..
……We are brought up to respect these persons in whom we have placed our trust to safeguard the public interest. It is difficult for each of us to accept that these may be misplaced. The studies that were presented to me were selected and showed only positive results. Studies that were in existence at that time that did not fit the concept that they were “selling,” were either omitted or declared to be “bad science.” The endorsements had been won by coercion and the self interest of professional elites. Some of the basic “facts” presented to me were, I found out later, of dubious validity. ……I know now that I was presented with what has been called “the tainted truth.”…. Fluoride is more toxic than lead! Since artificial fluoridation of water supplies began in 1945, total fluoride ingestion in North America has increased over five time what it was in the 1950’s. (3) The amount of fluoride in food and beverages has increased in non-fluoridated as well as fluoridated areas owing to the importation of food and beverages prepared in fluoridated areas. Children and adults have been slowly accumulating fluoride, a non-essential element (NAS 1989) and known poison, for fifty years due to its being deliberately added to drinking water with the active promotion of our public health authorities. by Richard G. Foulkes, M.D. and majority of my fellow councillors to agree to fluoridation of our water supply. that a marginal benefit existed. publicly changed my stance on fluoridation in 1983. Doctor Anna Goodwin speaks out about the dangers of water fluoridation. She also beLIEved in water fluoridation until she went to a fluoride seminar and questioned what they were saying. Doctor Lawrie Brett speaks out about the dangers of water fluoridation. Here is another formally pro-fluoride dentist, who decided to research for studies to back up his claims, but came to find there were none to be found and what he did find was opposite to what he had been lead to beLIEve. Dean was initially skeptical that there was any link between fluoridation and cancer but later came to believe ardently that fluoride was a major carcinogen, responsible for tens of thousands of deaths per year. With his NCI credentials, he was the most impressive witness the anti-fluoridation forces around the world had. Needless to say, this role did not endear him to the public health establishment, which fought for its right to medicate the entire public with fluoride in the public drinking water in the name of preventing tooth decay among children. “The political profluoridation stance has evolved into a dogmatic, authoritarian, essentially antiscientific posture, one that discourages open debate of scientific issues.” – Dr. Edward Groth, Senior Scientist, Consumers Union, 1991. Is there a consensus amongst the scientific community? Here is what some of them have to say about water fluoridation. Dr. Hardy Limeback, biochemist and Professor of Dentistry, University of Toronto, former consultant to the Canadian Dental Association. The latest defector from fluoridistas internationale is Dr Hardy Limeback, often cited by Canadian and US health officials in their defence of fluoridated water. But in a shock interview with journalist Michael Downey, published in Toronto’s Sunday Star, 25 April, Limeback joined the growing ranks of former fluoride promoters by conceding that fluoride may be destroying our bones, our teeth and our overall health. Professor Limeback is currently studying fluoride buildup in the body. “What we’re finding indicates a trend: Torontonians have double the fluoride levels in their hip bones compared to Montreal, where water is not fluoridated,” he said. “Children under three should never use fluoridated toothpaste. Or drink fluoridated water. And baby formula must never be made up using Toronto tap water. Never. In fluoridated areas, people should never use fluoride supplements. We tried to get them banned for children but (the dentists) wouldn’t even look at the evidence we presented” (See news.htm for full text). “What is the matter with your scientists that they allow your government to be so stupid?”, October 4, 1998, commenting on the UK government’s support for fluoridation. “Dental Fluorosis, no matter how slight is an irreversible pathological condition recognised by authorities around the world as the first readily detectable clinical symptom of previous chronic fluoride poisoning. Dr. P. Mullenix, Ph.D., research scientist, 1997 letter to Calgary Councillors. “Many individuals with impeccable credentials in science, dentistry, and medicine have published incontrovertible evidence that fluoridation is harmful and does not reduce the incidence of dental caries”. In the March 2001 issue of the journal Neuro Toxicology, a team of researchers led by Dr. Roger Masters of Dartmouth College reported evidence that public drinking water fluoridated with fluorosilicic acid is linked to higher levels of lead in children. “If further research confirms our findings,” Masters said, “this may well be the worst environmental poison since leaded gasoline.” The EPA admits it has no data on the health and behavioral effects of SiFs. The character or beliefs of the scientist are irrelevant; all that matters is whether the evidence supports his contention. Arguments from authority simply do not count; too many authorities have been mistaken too often. Fluorine interferes with the normal calcification of the teeth during the process of their formation so that affected teeth, in addition to being usually discolored and ugly in appearance, are structurally weak and deteriorate early in life. For this reason, it is especially important that fluorine be avoided during the period of tooth formation, that is, from birth to the age of 12 years. Dyson Rose, John Marier, Environmental Fluoride 1977, National Research Council of Canada (NRCC No. 16081). Fluoride is a persistent bioaccumulator, and is entering into human food-and-beverage chains in increasing amounts. Careful consideration of all available data indicates that the amount of fluoride ingested daily in foods and beverages by adult humans living in fluoridated communities currently ranges between 3.5 and 5.5 mg. … Long-term ingestion, with accumulation of fluoride in animals and man, induces metabolic and biochemical changes … There is no doubt that inadequate nutrition increases the severity of fluoride toxicosis. Fluorine is a general protoplasmic poison, but the most important symptoms of chronic fluorine poisoning known at present are mottling of the teeth and interference with bone formation. Chief Dental Officer, British Ministry of Health and Social Security, December 11, 1980. …no laboratory test has ever shown that 1 part per million fluoride in the drinking water reduces tooth decay. Bette Hileman, Fluoridation of Water, Chemical & Engineering News, August 1, 1988. Although skeletal fluorosis has been studied intensely in other countries for more than 40 years, virtually no research has been done in the U.S. to determine how many people are afflicted with the earlier stages of the disease, particularly the preclinical stages. Because some of the clinical symptoms mimic arthritis, the first two clinical phases of skeletal fluorosis could be easily misdiagnosed. Skeletal fluorosis is not even discussed in most medical texts under the effects of fluoride; indeed, a number of texts say the condition is almost nonexistent in the U.S. Even if a doctor is aware of the disease, the early stages are difficult to diagnose. We do know that the use of drinking water containing as little as 1.2 – 3.0 parts per million of fluorine will cause such developmental disturbances in bones as osteosclerosis, spondylosis and osteopetrosis, as well as goiter, and we cannot afford to run the risk of producing such serious systemic disturbances in applying what is at present a doubtful procedure intended to prevent development of dental disfigurements…. Fluorides are general protoplasmic poisons. Journal of the American Medical Association, Sept 18, 1943, Editorial. These are the disturbing findings of an assessment recently compiled by award-winning chemist, author, and founder of ThePeoplesChemist.com, Shane Ellison. says lawyer Paul Beeber, president of the New York State Coalition Opposed to Fluoridation. Doctor Jane Beck speaks out about the dangers of water fluoridation. She also speaks about, how it violates our informed consent. Contrary to what has been said by promoters of artificial fluoridation of public water supplies, these findings of fact were specifically sustained and upheld as having been established at trial by a preponderance of the evidence, as appears in Safe Water Foundation v. Houston, 661 S.W. 2d 189 (Tex. App. 1983). “CANCER INCREASED IN FLUORIDATED CITIES” – SUPREME COURT JUDGE. Contrary to what has been said by promoters of artificial fluoridation of public water supplies, Judge Flaherty’s jurisdiction to make and enter his findings on November 16, 1978 was expressly sustained and upheld. Paul Aitkenhead v. Borough of West View, No. GD-4585-78. Judge John P. Flaherty, now a Supreme Court Judge, presided over the trial in the case of Paul Aitkenhead v. Borough of West View, No. GD-4585-78. The city was sued over fluoridation. Contrary to what has been said by promoters of artificial fluoridation of public water supplies, Judge Flaherty’s jurisdiction to make and enter his findings on November 16, 1978 was expressly sustained and upheld as appears in Aitkenhead v. West View, 397 Atl. 2d 878 (Pa. Cmwlth. 1979). Nor were his findings ever disturbed on appeal. “It has been years now since the case involving fluoridation was before me as a trial judge, but since that time nothing I have seen changes my view of the serious hazards occasioned by public fluoridation. To the contrary, what I have read convinces me all the more that indepth, serious, scientific effort should be undertaken before further expanding a questionable practice. Those who belittle critics of fluoridation do the public a mis-service, yet it seems in the face of strong, uncontradicted prima facie evidence, that is the tactic most often employed. Whether government has the right to force what it perceives as a benefit to the public was not directly before me in the case, but that also is to be pondered. My hope is that groups such as yours will spur the scientific community into an objective posture on this issue. In this video Dr Marcus who was the chief toxicologist for the EPA, explains how fluoride causes cancer in the bones. Here is his memo in regards to the subject above. Fluoride is a poison! . . . it has been used as a pesticide for mice, rats and other small pests. A 10-pound infant could be killed by 1/100 of an ounce and a 100-pound adult could be killed by 1/10 of an ounce of fluoride. Here in the PDF document below, are sworn affidavits from various doctors, dentist and scientist who have been involved in the research on fluoride. As well as Dr. Marcus who was the chief toxicologist at the EPA and was instrumental in ending the addition of lead in gasoline. Robert J. Carton, PhD, was an environmental scientist who worked for over 30 years in the US federal government writing regulations, managing risk assessments on high priority toxic chemicals, and providing environmental oversight of medical research conducted by the government. From 1972–1992 he worked at the headquarters of the US Environmental Protection Agency in Washington, DC, and wrote the first regulations for controlling asbestos discharges from manufacturing plants. Fluoride Action Network | Who Opposes Fluoridation? …….Our opposition to drinking water fluoridation has grown, based on the scientific literature documenting the increasingly out-of-control exposures to fluoride, the lack of benefit to dental health from ingestion of fluoride and the hazards to human health from such ingestion. These hazards include acute toxic hazard, such as to people with impaired kidney function, as well as chronic toxic hazards of gene mutations, cancer, reproductive effects, neurotoxicity, bone pathology and dental fluorosis. First, a review of recent neurotoxicity research results……. ………The implication for the general public of these calculations is clear. Recent, peer-reviewed toxicity data, when applied to EPA’s standard method for controlling risks from toxic chemicals, require an immediate halt to the use of the nation’s drinking water reservoirs as disposal sites for the toxic waste of the phosphate fertilizer industry. Although the U.S. Centers for Disease Control hails water fluoridation as one of the “top ten public health achievements of the twentieth century,” most of the western world, including the vast majority of western Europe, does not fluoridate its water supply. At present, 97% of the western European population drinks non-fluoridated water. In total, 377,655,000 million people worldwide drink artificially fluoridated water. This represents 5% of the world’s population. So. There you have it. 95% of the world does not fluoridate it’s water and less than 30% of Canadians are being fluoridated. So why are we being fluoridated? Every body in the rest of the world should be loosing their teeth. Right? This short video ask the question. Artificial water fluoridation began in the 1950’s. Today, we know that drinking fluoride can impact health and fluoride has effects on the brain. Now, years later, science has been informed that drinking fluoride has brain impacts and is a neurotoxin very similar to lead, arsenic and mercury. Additionally, there is no informed medical consent given by each person when they are required to drink this unlabeled and odorless drug. In 2006, the National Research Council conducted a Scientific Review on Fluoride. Their findings indicate that the evidence does not support the supposed benefits of fluoridation but does support adverse health effects. Is Drinking Fluoride Safe? explores public water fluoridation. In a full length video produced by the Fluoride Action Network, respected professional researchers, scientists, and health practitioners openly discuss their experience and opinions concerning the adverse health effects and ethical problems associated with the public health policy of water fluoridation. Featuring a Nobel Laureate in Medicine, three scientists from the National Research Council’s landmark review on fluoride, as well as dentists, medical doctors, and leading researchers in the field, this professionally-produced 28 minute video presents a powerful indictment of the water fluoridation program. Money makes the world go round, so money talks and people can be bought. If you put your beliefs aside and really examine how the world works, you will find where there is big money involved, that money rules over human health and the environment most of the time and I will show this to you, here. I can give you other examples, but will provide you below, with one clear case where scientist were paid to provide an outcome to benefit the sugar industry at the expense of our health. As early as the 1960s, the sugar industry knew- because of research that had been done- that there was a possibility sugar played a role in heart disease. And they never said a word, in fact, they blamed fat. According to newly uncovered documents, in the 1960s the sugar industry began funding research to cast doubt on sugar’s role in heart disease, mainly by pointing the finger at fat instead. A recently published analysis based on correspondence between a sugar trade group and researchers from Harvard University clearly demonstrates how food and beverage makers actively shape the public’s understanding of nutrition for their own financial gain. In 1964, the group now known as the Sugar Association internally discussed a campaign to address “negative attitudes toward sugar” after studies began emerging linking sugar with heart disease, according to documents dug up from public archives. The following year the group approved “Project 226,” which entailed paying Harvard researchers today’s equivalent of $48,900 US for an article reviewing the scientific literature, supplying materials they wanted reviewed, and receiving drafts of the article. The resulting article published in 1967 concluded there was “no doubt” that reducing cholesterol and saturated fat was the only dietary intervention needed to prevent heart disease. The researchers overstated the consistency of the literature on fat and cholesterol, while downplaying studies on sugar, according to the analysis.Here is one more. Here we have wireless phone industry skewing information to make phones appear to be safe. Can we always trust doctors and dentist endorsements? Here we have a commercial where doctors are actually endorsing cigarettes. How many decades did we hear from the scientists who worked for industry that cigarettes weren’t addictive, even in the face of mounting research. The American Cancer Society states the “During 1995, approximately 2.1 million people in developed countries died as a result of smoking. Tobacco use is responsible for nearly one in five deaths in the United States. But it was 100% safe just a few years ago. In the 1950’s, 19,293 dentists advised us that smoking was o.k. – we’re professionals, trust us. Earlier scientists for the government approved DDT was safe and effective. Around that same time water fluoridation was also said to be safe. Mainstream scientists were wrong about tobacco and DDT. Scientists and government agencies approved a variety of chemicals and drugs and told us they were extensively tested and were safe. You be the judge as to how safe fluoride it is for your children and families – that’s the only sensible thing to do, after all, you betting their long term health. Here is a cigarette commercial where they lie by omission. They say that it has no adverse effects, but fail to mention lungs in their commercial and we all know cigarette smoking causes lung cancer. Just like cigarette smoking then, people are told today that fluoride is good for you yet there is no science prove it. The best that they can come up with these days is their Dissociation theory, which I will cover in a later post. Here you have CEO’s of different cigarette corporations spinning their common narrative, just like certain government officials spinning “Fluoride is Safe and effective”, yet coming up with no science to back up their claims. They will deny anything presented to them as unsupported facts. These people are professionals at the art of spinning nonsense and creating doubt in the minds of most people who have done little research for themselves. So how can we trust doctors and dentist, when even they, have shown that they can and do get duped into believing lies, which have caused them to harm themselves and others, by saying these products were in fact safe. Why is that? That is something most of us are guilt of. Trusting and beLIEving blindly what we have been told, without questioning it or researching it for ourselves to even see if it is true or not. Bottom line “to beLIEve is to not know”. You just took someone’s word that it was true without checking that it was in fact true. So when you are done here, you should do your own research to confirm for yourself what you feel to be true. That is your responsibility. How much time have dentist actually spent learning about water fluoridation? Here is another dentist who finally took the time to do his own research and like many others, found he had been deceived and took up the cause to end water fluoridation. I Graduated from the University of Missouri-Kansas City School of Dentistry 1972. I began my practice of general dentistry in Tulsa OK in 1972. I used fluoride and mercury in my dental practice until I woke up to the fluoride fraud in the early 1980’s and the mercury deception in 1991. In addition to testifying at an EPA hearing opposing the fluoridation of public drinking water, I have worked with some communities in their opposition to the fluoridation of their drinking water. I have also worked with communities experiencing pollution problems to educate those folks as to how the Establishment has altered, distorted and misrepresented the science in order to redefine Webster’s definition of the word “safe.” This redefining is done to assist Corporate America in conning the pubic (That’s you) into believing that some very hazardous chemicals are “without any adverse health effects” and are therefore “safe” when in fact they are not “safe” as “safe” really doesn’t mean “safe” anymore. This Fluoride Fraud section will explain how we have all been duped by the American Dental Association, the United States Public Health Service and Corporate America in their attempt to have us believe that fluorine, a very reactive and extremely toxic chemical, when added to the public’s drinking water supply will somehow reduce tooth decay and is somehow “safe” for us to consume. I am giving you two different PDF’s to read. One is a short version that I wrote several years ago and it will give you a snapshot story of this Fluoride Fraud and some insight as to how this fluoride fraud has been imposed on all of us by the greedy ones. The longer version will give you considerable more information. Due to the length of this longer version the PDF does take longer to download. Be patient! All dentists have been to dental school and basically followed the same curricula. One subject conspicuously absent from our training has been that of water fluoridation. The result is that dentists have neither a historical nor a scientific understanding of it. Furthermore, the ADA does not want us to learn about it in any depth, because if we did, we’d realize what an unscientific and tragic mistake it has been. There’s no course called Fluoridation 101 in dental school. We were taught only a smidgen about fluoridation, mostly the early skewed and flawed reports from the late 1940s and beyond. Any fluoride science before 1940 was omitted. However, I’ve found that when dentists learn the historical fluoride science from 1900 to 1940, they usually cease their support of water fluoridation. Ladies and Gentlemen. I have often been asked questions about my credentials . . . my background . . . my qualification to speak or write about fluoride . . . my right, so to speak, to disagree with a dentist or physician. In 1976, while living in Lansing, Michigan, I met our local typical little old lady in tennis shoes, carrying a large paper shopping bag full of tattered newspaper clippings and copies of magazine articles about fluoride. She told me fluoride caused cancer and was put into our water to keep us docile. I was 35, she was in her mid- 60s, and I immediately classified her as a nutcase. Then, one day, I got curious and looked in my pharmacology book to see what I could find about fluoride. What I found changed my life. I learned that when the drinking water contained about one part per million of fluoride, 10 to 15 percent of the children would show a faint change in the appearance of their teeth called dental fluorosis; but with 2 or 3 parts per million, nearly all will be affected by this first and only visible sign of fluoride poisoning. I also learned that fluoride is the key ingredient in a widely used cancer drug called 5-FU. The cells die because fluorine enters into one of the molecules in DNA — the genetic material. So “fluoride” has, according to the pharmacology book, the ability to enter into our DNA and affect our molecules, as stated above. If that doesn’t concern you what will? What kind of genetic damage could this be doing to us and our children? So I hope you have come to realise that our drinking water is far from being pristine, contrary to what we are led to believe. In fact there are “contaminants” as USA Environmental Protection Agency (EPA) calls them, added to our drinking water, that are harmful to our health over an extended period of use. The EPA identifies contaminants to regulate in drinking water to protect public health. The Agency sets regulatory limits for the amounts of certain contaminants in water provided by public water systems. These contaminant standards are required by the Safe Drinking Water Act (SDWA). Here in Ontario, we use the EPA calculated safety standards for our Safe Drinking Water Act (SDWA). I will provide you with proof as we will cover the SDWA later. In fact “FLUORIDE” is one of these contaminants as you will see. Here is a screen shot from the EPA’s website. Fluoride as stated, is in fact listed as a “contaminant”. Also note under health effects is bone disease and mottled teeth. This is the first clue that it is not safe. I will cover these further as we go along . I have also included from the list of contaminants ” Arsenic. Lead, Mercury, Radium” which are all part of the make up of “Hydrofluorosilicic Acid” that we spoke of above. So we have a situation here where contaminants known to cause cancer and other health issue are being reintroduced to the water supply. Most would say they are such small amounts that they cannot have any effect on us. I say NONSENSE to that. All of these, including all chemicals that find there way into the body, either by inhalation, absorption, ingestion or injection have a cumulative effect on the body over a lifetime. On young babies who have no natural immunity, these toxic chemicals can have devastating effects. The body can only purge so much of these toxic chemicals. One thing most people have failed to even consider is a process called synergistic toxicity. the white, compact, and very hard substance covering and protecting the dentin of the crown of a tooth. mottled enamel a chronic endemic form of hypoplasia of the dental enamel caused by drinking water with a high fluoride content when a child is in the time of tooth formation. It is characterized by defective calcification that gives a white chalky appearance to the enamel, which gradually undergoes brown discoloration. See also dental fluorosis. alterations in enamel structure often due to excessive fluoride ingestion during tooth formation; varies in appearance from small white opacities to yellow and black spotting. Discolored and spotted tooth enamel caused by excessive amounts of fluorides in drinking water. The American Heritage® Medical Dictionary Copyright © 2007, 2004 by Houghton Mifflin Company. Published by . All rights reserved. Alterations in enamel structure often due to excessive fluoride ingestion during tooth formation. Mottling may also be caused by tetracycline therapy during the first half of pregnancy or in children whose teeth are still developing. Alterations in enamel structure often due to excessive fluoride ingestion during tooth formation. So what does mottled teeth also known as dental fluorosis look like? If you do a search of either or click on the links above, you will get images that look like the photo below. From mild to severe. Seriously, if you examine some of the teeth in the photo above, do they look like the kind of teeth that you would want or your children to have? If you live in a fluoridated city your child’s risk increases. Why Is a Drug Added to Water When the Dose Cannot Be Controlled? So why would dentist continue to endorse water fluoridation? Because they have been led to beLIEve it is safe and effective. Educate your dentist and share this website with them. “Common sense should tell us that if a poison circulating in a child’s body can damage the tooth-forming cells, then other harm also is likely.” – Dr. John Colquhoun (1997). When waterfluoridation first began in the 1940s, dentists believed that fluoride’s main benefit came from ingesting fluoride during the early years of life. This belief held sway for over 40 years. However, it is now acknowledged by dental researchers to be incorrect. According to the Centres for Disease Control, fluoride’s predominant effect is topical (direct contact with teeth) and not systemic (from ingestion). Hence, there is no need to ingest fluoride to derive its purported benefit for teeth. (CDC, 1999, MMWR 48: 933-940). Also what showed up in the search for mottled teeth was a link to skeletal fluorosis. skeletal changes caused by long-term ingestion of excessive fluoride, including hyperostosis, osteopetrosis, and osteoporosis. A search of bone disease also brought up skeletal fluorosis. Here are a couple of articles that explain that in more details. Many people have this idea that natural occurring fluoride is good for you. That is a false assumption. In countries where there are high amounts of natural occurring fluoride in the drinking water, it is causing serious crippling and deforming effects to young children. This is severe skeletal fluorosis from drinking natural fluoride. For people who have consumed excessive amounts of fluoride over a lifetime, the effects are somewhat different, but still debilitating. Look around you, what do you see? The evidence is clear that the risks of fluoride far outweigh any minor benefit to teeth. The precautionary principle needs to be applied. An increase in more severe skeletal fluorosis is due to erupt as older people enter the risk window. Water fluoridation should cease immediately and steps should be taken to reduce fluoride in food, drink, and dental products. The People’s Republic of China Department of Endemic Disease Control has identified natural fluoride in drinking water as the source of significant crippling and paralysis in many communities. They have also identified dental fluorosis in children as a signal of which child will first become afflicted. Dental fluorosis has also been linked to not only damaged bones but damaged brains. While the worlds largest communist nation is reducing their population’s exposure to fluoride, US and its English speaking allies are forcing increased exposure to fluoride on their subjects through mandatory fluoridation. babies in utero can be overexposed to fluoride. of maternal levels, so her baby in the womb receives about 0.3 mg of fluoride. Inform and hold accountable those responsible for adding fluoride to your drinking water. Ignorance is no longer an excuse. To knowingly overexpose babies in the womb to a developmental neurotoxicant is unforgivable. Insist on and litigate if necessary a pregnancy advisory for fluoridated tap water. their unborn child receives from fluoridated tap water. Fluoridation of a public water supply is an ethical offense against us all. Here is a copy of the letter Submitted by: Dr. James Beck, MD, at the meeting SPC for Utilities and the Environment. City of Calgary Council Chambers. Wednesday January 26, 2011. Dr Beck was instrumental in the ending of water fluoridation in Calgary. In 1957 the Supreme Court of Canada ruled that fluoridation is “compulsory preventive medication”. The court’s ruling is significant because it legitimizes the common-sense conclusion that we are being medicated and it puts the matter clearly in the realm of medical ethics. Medical ethics in turn is embedded in human rights. Here is how fluoridation violates the code of medical ethics. It is administration of a drug without control of dosage (controlling concentration in our water is not controlling dose or dosage). It is administration of a drug without informed consent of the recipient. It does not provide monitoring of the effects on the recipient. It is not possible for the recipient to stop receiving the drug (many can not get nonfluoridated water and none of us can avoid exposure from foods and drinks processed where tap water is fluoridated). The drug has not been shown to be safe for human consumption. Fluoridation of a public water supply is not only an ethical offense against us all, it is clearly a more serious offense against those subgroups of our population which are particularly at risk of harm from fluoride. These groups include infants being fed with formula reconstituted with tap water, diabetics, persons deficient in iodine intake, persons with kidney disease, boys during the eight-year-old’s growth spurt, and others. It is an obligation of city councils and of Alberta Health Services to protect all, not just the average or just the majority. Several councilors have rightly been concerned about the dental health of children of low-income families. It is said that fluoridation is of particular benefit to poor children. That has been investigated. It is found that the fluoridated poor groups have no better cavity experience than do the nonfluoridated poor groups. Furthermore, it is found that the prevalence of cavities increases as family income decreases. It’s not fluoride that would benefit poor children; it’s a higher standard of living, probably better diet and better oral hygiene. Now what kind of ethical consciousness allows one to continue to apply a possibly harmful process to unwilling people until there is absolute proof that it is harmful? I have seen this backward approach to safety in government reports on fluoridation. It goes like this: this study that shows association of fluoridation with this harmful effect is not a perfect study; there are weaknesses; therefore we will continue the process until it is shown with certainty that it is harmful. And no further research is recommended; no responsibility to support a better study is accepted. In the presence of a small and dubious benefit such a conclusion, more than being irresponsible, is outlandish. You don’t have the moral right to do this to us, to one million people. You should stop it now. The questions is simple . Does the single possible benefit outweight all the known harm? Is the water fluoridation process even legal? The answer to both those questions is clearly “NO”. – that governments are putting toxic waste in our drinking water using it to circumvent environmental laws while still polluting rivers and lakes. – the science is based on scientifically fraudulent information and altered reports. – deception is used to get people to promote and believe that fluoride is safe and effectice, when it is in fact neither. I will provide further evidence in my blog that will reinforce the fact that water fluoridation is not safe, legal and nor is it effective as it is being promoted. At what point do you start to care enough to get involved? It is going to take some effort to get this out of our water. Please proceed to my “Link Page” where I will provide, a link to each post made on my site for quicker and easier access. The Fluoride Free Sudbury website contains copyrighted material the use of which has not always been specifically authorized by the copyright owner. We are making such material available in our efforts to advance public understanding of medical, environmental, human rights, scientific, and social justice issues, etc. We believe this constitutes a ‘fair use’ of any such copyrighted material as provided for in section 107 of the US Copyright Law. In accordance with Title 17 U.S.C. Section 107, the material on this site is for educational purposes. For more information on the copyright law, please go to: http://www.law.cornell.edu/uscode/17/107.shtml. If you wish to use copyrighted material from this site for purposes of your own that go beyond “fair use,” you must obtain permission from the copyright owner. We do not offer this material for sale, nor do we have the authority to grant permission for its reuse.